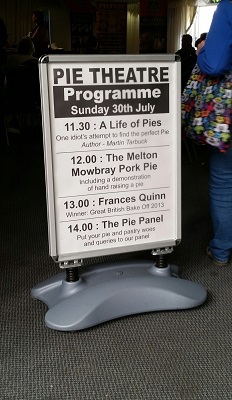 I was kindly invited there on the Sunday to talk about my book and my exploits whilst writing it, along with my experiences of pie traditions up and down the country and what I like to see in a good pie. 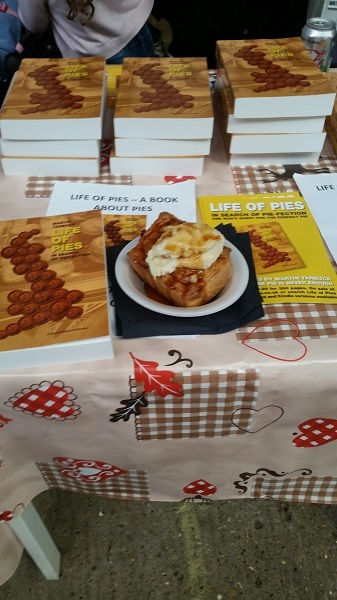 It was great to speak in front of close to 100 attentive people in the Pie Theatre and following my talk, I set up stall and managed to sell a box of books whilst chatting to eager pie lovers. 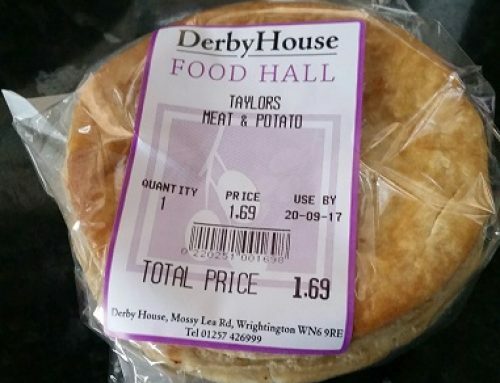 Thankfully I also had Mrs T with me which enabled me to go for a potter about and look at what pies were on offer. Where to start!! They were about 30 pie sellers set out in four separate market halls, and there were also traders selling wines, spirits, cheese, chocolate and a couple of real ale and cider bars. Foodie* heaven. 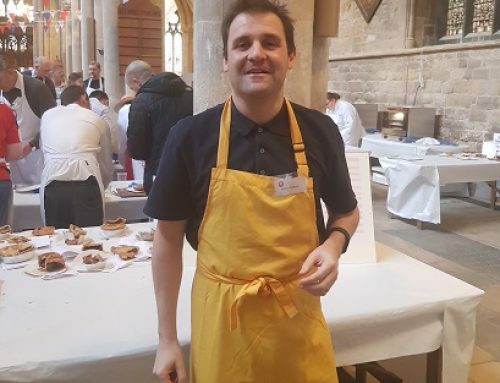 *Although as the highly entertaining @Danny_McMoomins off Twitter might say “Calling yourself a foodie is just another way of saying you’re a fat get”. A view I certainly personally subscribe to. 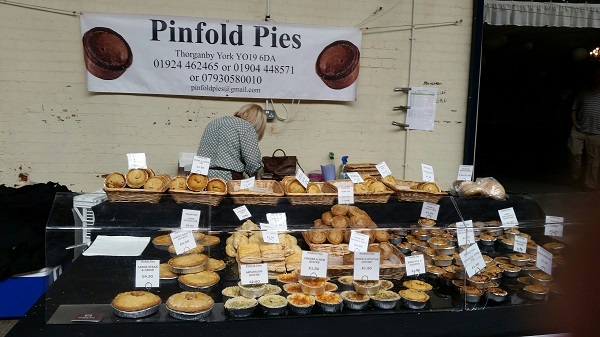 My table was set up next to Pinfold Pies from close to York, and I reckon they were one of the busiest stalls at the whole event. No surprise really given the quantities of pies they had on display. I was always going to buy their pies but when they knocked them down to £1 each I couldn’t help but dive in. Despite staying in a hotel, I skipped a full English breakfast. A cardinal sin I know but one I felt necessary in order to give my stomach an airing both ahead of my talk and to leave room for more pies. Several vendors were selling hot pies, with mash, peas and gravy and it was the Dunkleys pie stall I made a beeline for as it was really busy and picked up a feather blade of beef and Rioja pie with mash and gravy. From there I paid a visit to the Nice Pie stall. Based in Melton Mowbray and with a shop and café in the centre, I have heard good things about them on Twitter, in particular from the PieRateers, but I’ve never tried their wares. Although they have lots of conventional pies, they also do a nice line in squirrel pies and zebra pies. I have now stuck the squirrel pie in the freezer and we are going to live taste it on a future Pie at Night podcast. 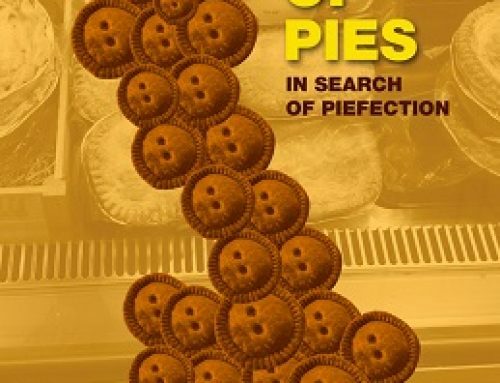 Elsewhere, there were many other notable pie makers including Brocklebys, Grasmere Farm, Hambleton Bakery, and The Rutland Pie Maker, a new one on me but thanks for buying a book! And of course, Dickinson and Morris had a prominent stall as you’d expect. 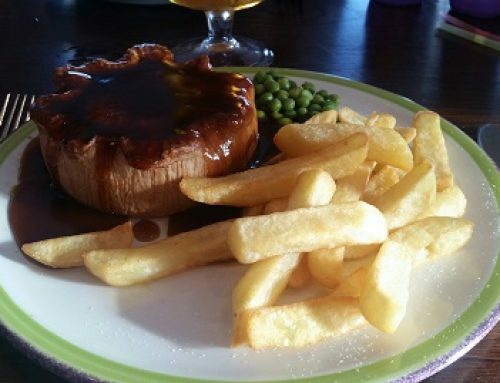 As if to demonstrate that you’re never far away from a pie in Melton Mowbray, we actually had a meal at an Italian restaurant called Amici* on Friday night, and my window view was straight facing the Old Pork Pie Shoppe. With a day out at a nearby theme park thrown in as well, Melton Mowbray is fast becoming one of my favourite places in the country. With “Cheese Fest” and “Choc Fest” all to come later in the year and of course the annual British Pie Awards being hosted here, it is indeed a marvellous place to spend some time in. And no, these words are not being sponsored by the Melton Mowbray Tourist Board! We can only hope that the council in my own home town of Wigan invests in promoting it’s love of pie in the same manner one day, aside from the amusing once a year scoff-a-thon that is the World Pie Eating Championship at Harrys Bar. 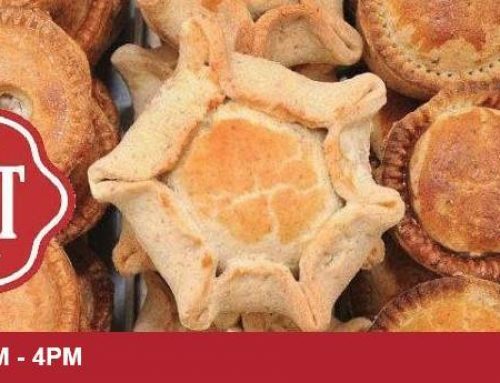 In the meantime, PieFest is set to grow every year and I can well recommend a visit to the next one, or indeed a trip to MM to see how this pie town ticks.